Looking back at the “Great Recession” of 2007-2009, most of us are still smarting and looking over our shoulders even though the economy and the industry have recovered, and business is thriving. But we all know that labor shortages and the demand, while strong, will cycle as it has for the last 100 years. A recent economic research paper from the Federal Reserve Bank in St. Louis carrying the title, Industry Connectivity: A Case Study of the Construction Industry sheds some light on the role of construction in the economy and illustrates some of the signals that could give us an early warning of any coming dip in the economy in the next few years. Some basics facts covered in the paper. The construction Industry is responsible for about 5% of the economic output of the country. Any shocks to the construction industry will impact the rest of the economy. 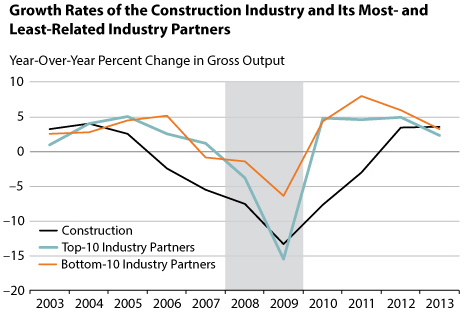 The economists should pay attention to the construction industry as a precursor or indicator for an economic dip. “The construction industry's output started to decline in 2004, a year or two before the two composite groups.” Those two groups are the most related and the least related industries. Both of them went into the recession later and rebounded earlier than construction.